According to Digitimes, MediaTek is looking to get its chips inside high-end smartphones. A report published yesterday says that the Taiwan based chip designer has been talking to smartphone manufacturers such as Apple, Samsung and Xiaomi in an attempt to find "business cooperation opportunities." MediaTek is known for offering high-end components for lower-end products, which has kept it out of the flagship market. Digitimes says that offering such high performance chips for lower end handsets usually works when a "latecomer" enters a market seeking immediate market share. But when a company like MediaTek starts adding cutting-edge features such as AI capabilities, it might prevent such a firm from gaining access to high-end phones. This could be why MediaTek was unable to gain any traction with the Helio X30, leading MediaTek to stop producing and developing its Helio X chips for high-end devices. MediaTek plans on using its AI technology to sell chips across different markets including the computer, communications, consumer electronics and automobile industries. As far as the smartphone industry is concerned, MediaTek has to deal with the fact that several phone manufacturers are designing their own AI technology built right into their SoCs. And of course, Qualcomm continues to have a stranglehold on chipsets for U.S. bound handsets (although things could change next month after the FTC v. Qualcomm trial). 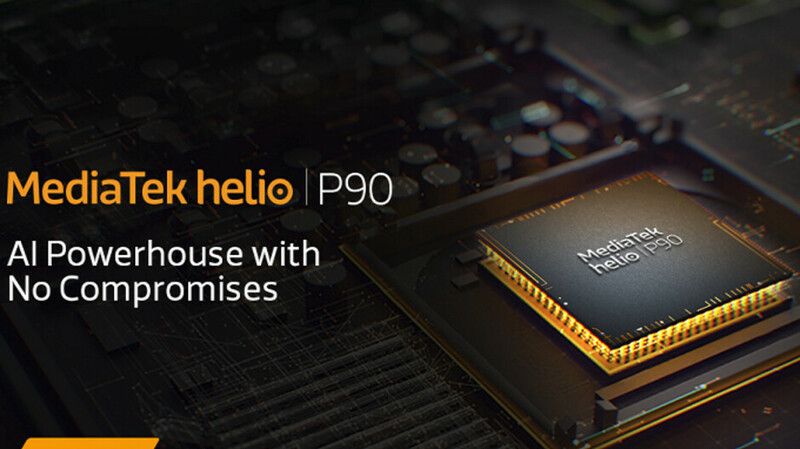 Speaking of AI, MediaTek recently unveiled the Helio P90, made for mid-range phones. Produced using the 12nm process, the SoC includes a multi-core AI processing unit (APU) that offers 4 times the AI performance found on the P60 and P70 chips. The APU allows phone manufacturers to give customers the ability to take high quality photographs using more affordable phones. Extremely poor GPU compared to the competitors(especially Qualcomm), poor support overtime, poor efficiency and no experience in designing High End CPUs aren't going to help you get your place in Flagships EVER! AI in phones is just a fancy gimmick. Good luck with that. Sure, but first start using minimum of 4 A76 for CPU and 10 Mali-G76 cores for GPU, upgrade the ISP to at least a decent one and manufacture the whole chip in 7nm process node then we can talk. Nobody will give you a free pass as long as you stick to underpowered P series.. just release next generation Helio X series processor already! If that "MediaTek is known for offering high-end components for lower-end products, which has kept it out of the flagship market" was the true, their chips would not be drop and Snapdragon be used instead. Xiaomi, Sony, Samsung, Nokia, LG , HTC, BB etc. Maybe you meant certain matkets otherwise it is not true. High end components does not translate into high end performance and efficiency. P90 is by no means a high-end chipset. It can barely trade blows with SD710 which is a mid-range chipset. No way it will EVER be in ANY high-end phones. Chinese market will maybe use it, if it is priced right, but not for high end. High end is Snapdragon, Kirin and Exynos (for Android). If they are thinking of its chips in high end phones then, They must making new x series processor and may launch in 2019. Tesla wanna make their own chips, maybe the should buy MediaTek? How hard is it to design a high-end Helio X40?? Just do this: CPU: 2xA76@2.8 GHz + 2xA76@2.2 + 2xA55@2.0. GPU: Mali G76-MP14 AI: Dedicated NPU with 3-4 Trillion operations per second. Bt 5.0, wifi ac, 1.4GHz LTE modem, support for 4kHDR@60 FPS, very good ISP (or dual ISP), etc. And of course, built on TSMC's 7nm Optical node. They stopped making high end chips not because it's hard but because there's no customer for their chips in high end market. There x30 soc merely used in phones. Btw, What about 4x A76@2.8ghz 4x A55@2.0ghz 2x A35@2.0ghz. 10 cores are useless in a phone. Even 8 are too much as a phone hardly ever uses more than 2 cores at once. That's one of the reasons why iPhone 6s with its dual-core CPU was beating so many flagships with octa and deca-core CPUs, in real life CPU performance tests (it still does!). Therefore, my Hexa-core setup seems great. And there's no customer for their X chips bcoz their chips were trash. Qualcomm has mostly been ahead of MT so why choose the inferior brand? If MT can learn their lesson and have proper flagships then maybe they can get back in the high-end game. Right now Qualcomm has a monopoly, and that needs to end just like Intel's was ended by AMD. This will likely benefit the consumers. 2x a35 cores are there for better battery life. As phones with x30 uses only 2 super power efficient a35 cores. And a53 for moderate work. A7x cores for high performance workloads. Btw I know that mediatek chips are inferior compared to qualcomm but also cheaper compared to qualcomm. There chips are just like pocofone not as amazing and great like other flagships but definitely unbeatable at their price. 2x A35 will make the phone lag heavily. So forget them. Not even entry level phones use the A35 cores.... But as I said, no need for more than 6 cores on a phone. And A53? Why not the A55?? And dude, the Pocophone uses the Sd 845; what do you mean by "not as amazing and great like other flagships"? Pocofone clearly falls behind compared to OnePlus 6t, note 9,pixels etc. But it is best and unbeatable in its price range compared to what other brands are offering. And mediatek is also clearly falls behind qualcomm,Exynos and kirin but there Soc are best in the price range compared to the offering Soc from qualcomm and Exynos. Where does the Poco fall behind other sd 845 phones? Where are you pulling this fake info out of?? Stop lying.... And since Mediatek only makes mid range and low end chips, you cannot compare those chips to high end chips from other brands. But comparing mid range chips, mediatek produces better ones than Exynos and Kirin. The helio P60 offers higher CPU and GPU performance than Kirin 710 and Exynos midrange chips. So there you have my facts. Don't reply to me until you have facts also. Are you really that dumb, Pocofone is best in its price but if i ask you what you choose between pocofone or OnePlus 6T if both were priced same. Pocofone is good because it's best compared to others at that price who uses SD636 SD660,SD710 at that price point. Btw I am not comparing mediatek midrange Soc to current flagship Soc. I'm taking about it in the past x30 compared to SD821 was inferior but phones x30 was little cheaper than SD660 at that time and definitely better than SD660. I was referring to the Poco having similar performance to other sd 845 flagships, not that it has similar or better features than them. You should have guessed that by now. And between the 6T and the pocofone, I would choose the former only if I want to spend 550 on a phone. If not, then I will go with the f1. And u should have told it before that you were talking about the x30, and not the p60. Be clear whenever u say something. If mediatek still had flagship Soc than pocofone may even come around $250. Btw, Helio P60 is actually cheaper than sd660,636,SD632 and little higher than SD450. Now, decide yourself you want a SD450 Soc or Helio P60 Soc powering your phone. Just like that a mediatek flagship processor might be available for makers for almost at the price of SD710 or even lower. The Helio P60 has a worse GPU than both Sd 660 and 636. And it also lacks in some other key areas. Now sure I would take the P60 over Sd 450 any day, but not over the above-mentioned two. And read comment no.7 if you wanna know what a good MT flagship would be. Please no. MediaTek's chips are garbage. Mediatek has been working really hard giving a big competition to the players in the market!